Facing arguably their toughest matchup of the tournament without their best player, Auburn found a way to gut out an incredible victory and punch their first ticket ever to the Final Four. After boat racing the second most winningest college basketball program in the Kansas Jayhawks in the Round of 32 and putting together a dominant 2nd half against the third most winningest basketball program in the Sweet 16 in the North Carolina Tar Heels, Auburn found themselves facing college basketball’s most winningest program in the Kentucky Wildcats in the Elite 8. The same squad that had beaten the Tigers twice already, including a 27 point thumping in Lexington, KY when the Kats were down Reid Travis and Auburn still had Chuma Okeke. This go around, Auburn would not have their star forward while UK would have their big man. It didn’t look good. Instead, these Auburn Tigers made history, rallying to take down John Calipari’s Wildcats and head to the Final Four for the first time in school history. They did it with Jared Harper’s drives, Bryce Brown’s shooting and a defensive effort that refused to give an inch down low even though they were out gunned and out manned. I don’t think it’s an understatement to say it was the most important victory in Auburn basketball history and they did it without their best player. Let’s relive the best moments. For the first 17 minutes of this contest there sure weren’t a ton of Auburn highlights. However, the Tigers did enough to keep things at a 10-11 point disadvantage for most of the half. Then they caught fire to close out the half starting with this 4 point play by Jared Harper to cut a 10 pt lead to 6. The next time down the floor Auburn exploited a mismatch beautifully for two points. Anfernee McElmore sets a screen up top for Bryce Brown. McElmore’s man hedges hard to take away the three but that results in Kentucky’s point guard Ashton Hagans being matched up on Anfernee. McElmore breaks to the basket off the screen but PJ Washington blocks the entry past for Danjel so he smartly reverses it back to Brown who feeds Auburn’s center down low. McElmore wastes no time going over his right shoulder for the bucket. Kentucky’s 5* PG and former Auburn lean Ashton Hagans had 7 turnovers Sunday afternoon. This was a big one early in the 2nd half leading to a transition 3 by Bryce Brown and really the start of Auburn’s big 2nd half run. But what I really love about this play is Jared Harper dishing it to Brown and then slyly giving Tyler Herro the bump so that he can’t block Brown’s shot. 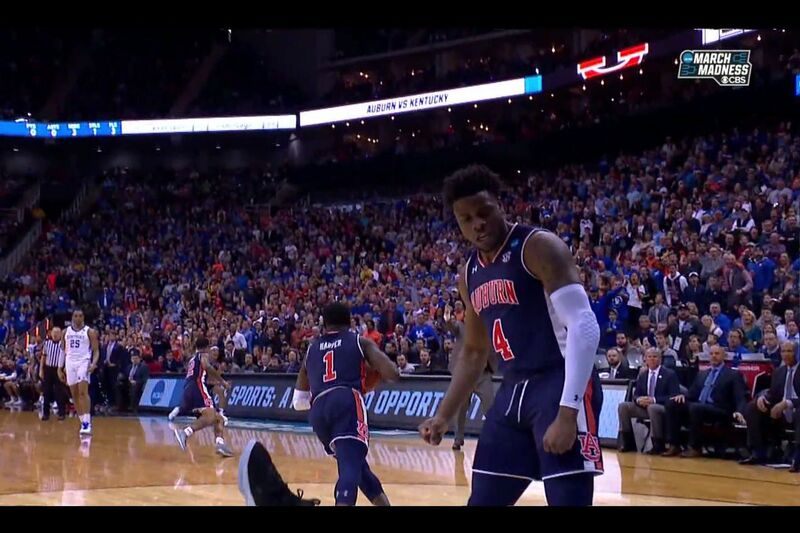 This sequence will live in Auburn basketball lore forever. I had to include the actual call because it was such an awesome moment. Bryce Brown goes full Reggie Miller intercepting an ill advised save from PJ Washington and then burying a three from the corner to complete the rare 5 point play. That gave Auburn their first lead of the game and from then on it was a streetfight. Anfernee McElmore has had an up and down season but Sunday was definitely an up. This is actually a REALLY good back door cut by Herro that beats Malik Dunbar but McElmore does a beautiful job of sliding over, keeping his arms straight up, jumping straight up and blocking the shot. Jared then does what Jared does and quickly gets the ball up court for an alley-oop to J’Von McCormick. Who doesn’t love a point guard alley-oop? So I HAD to include the sound on this play too because MY GAWD MALIK DUNBAR WHAT HAVE YOU DONE?!?! Relentless is the best way to describe this Auburn team and this play shows it. It started with a missed alley-oop to Dunbar but instead of pouting, he hustles down the court and DENIES Kentucky’s easy basket. It results in a Jared Harper trip to the foul line the other way. For much of the 2nd half it was the Bryce Brown show but not in the way you normally expect it. Of course there were some deep bombs but with UK aggressively defending Brown on the perimeter he had to create some shots for himself and many came from inside the 3 point line. What I love about this drive is Herro puts his hand up because he’s understandably worried about Brown pulling up suddenly. However, when Brown sees his hand goes up he attacks and gets a step on the UK defender. Then plants his foot and buries the jumper. Plays like this will get NBA scouts attention. Tyler Herro and Ashton Hagans are Kentucky’s best on ball defenders. They had no answer for Auburn’s backcourt of Bryce Brown and Jared Harper Sunday. Brown AGAIN beats Herro off the dribble and knocks down the step back jumper. Auburn’s offense hit a serious lull late in the game and the Wildcats surged back ahead with under a minute to play. For most other Auburn teams, Kentucky taking a late lead is probably the end. You aren’t supposed to come back, I mean it’s Kentucky. But this ain’t your momma’s Auburn team. Jared Harper blows by poor Tyler Herro and finishes to tie up the game. PJ Washington had been an unholy force much of the afternoon and so it was pretty terrifying when he got the ball late with a chance to send UK to the Final Four. But senior Horace Spencer, who has lived through the highs and lows of the Auburn basketball program, held his ground and rejected the big man’s attempt. Then Reid Travis corralled the loose ball, fed it to Keldon Johnson, the #2 scoring threat on the day, who drove only to be met on the opposite side by Anfernee McElmore. Auburn’s front court is far from elite but they sure as hell will make you fight for every single point. Don’t EVER go to sleep when you are responsible for guarding Jared Harper. He will make you pay. This might have been my favorite call of the game. EXCUUUUSE ME! PJ Washington was a monster Sunday but he also had five turnovers. None bigger than this one when McElmore rips him and goes the other way with it. I’m not entirely certain what happens to Anfernee here on the layup but he seems fine and he got the bucket. Auburn is 3-0 in overtime games this year. Why? Because they have Jared Harper... This might be my favorite finish of his career. He blows by Ashton Hagans and then cleverly dodges Washington in the air before dropping in the sweet floater. When the game is on the line, there is no player in the country I would rather have the ball than Jared Harper. Any hope Kentucky had at a miracle comeback, Anfernee McElmore promptly swatted away to help send the Tigers to the Final Four. AUBURN IS IN THE FINAL FOUR!!!! Finally, if you haven’t watched this video yet, you absolutely should.